A North Bergen mom’s prayers have been answered. Nancy Gonzalez’s son Diego was missing since Wednesday afternoon, but was found at 2:30 am in Braddock Park, thanks to some great detective work by the North Bergen Police Department. Then Gonzalez says they got a clue that the 14-year-old was seen at CVS on 80th Street. So officers looked there and were told the teen ran into the park. 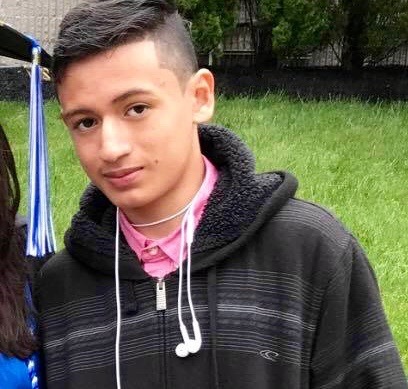 When he was last seen, Diego was wearing his North Bergen High School black shirt and black pants. The family found his cell phone in the bushes behind North Bergen Preschool. When Hudson TV reached out to North Bergen Police for more information, we were told the Hudson County Sheriff’s Department was handling the matter. “The Sheriff’s Department didn’t even know we found him until after we finished with the NBPD,” Gonzalez says. He is on Georgie’s Soccer team . Prayers for the Family!! GOD BLESS!! GOOD ! Glad he is found ! Great news, kudos to NBPD. Great work by the North Bergen Police Dept! However, this is further indication the Preschool location is not safe – these woods adjacent to it are where people hide, homeless have lived, people have died. There isn’t anything I could find in the internet media that explains whether a recent hanging in the woods was a suicide or a murder. The Preschool fence will not keep anyone out who shouldn’t be there and it’s a good thing this Preschool will be moved out of the park for the 2018-19 school year thanks to NJDEP Green Acres who are correcting North Bergen Preschool’s illegal 2001 move into the Park. Green Acres made sure that NB looked into acquiring Hi-Tech H.S. as a means of getting the Preschool out of the Park, where it doesn’t belong – the park is reserved for open space and recreation. 2 Preschool trailers had to be replaced after Hurricane Sandy, because a tree fell onto electric wires and the trailers caught fire. There have been traffic accidents at the Preschool location that North Bergen and Hudson County don’t owe up to. And even though the Hudson County Engineer recommended widening the narrow Preschool roadway and adding sidewalks, this work is not going to be undertaken. So he wasn’t missing, well he basically ran away or just staying away from his family ? I’m glad he was found! Great job, North Bergen PD! But, you can’t cause a mass hysteria announcing that a kid is missing. Then, just say he was found without giving specifics on the nature of what occurred that caused him to be “missing, in the first place! Did he run away? Was he kidnapped? Was it gang related? Was it drug related? Please elaborate! Exactly. I thought something serious was going on, not just a kid who didn’t want to come home.